I met Karen and her husband Rich when they enrolled in my Self-Publishing Roadmap video training course last year. I’ve followed their progress with interest, and attended their book launch party, which was held right here in San Rafael a few weeks ago. I asked Karen how she came to be a self-publisher, and here’s her report. Two years ago, after vaguely mulling over the subject for ages, I woke up one day with a clear vision of how I could write a fresh book about my experiences as an American living in Seville, Spain. I sat down and began pounding out a rough first draft, and after three months I had a 50,000-word manuscript sitting on my desk. It was a misshapen, awkward, teenage version of itself, but the bones and essential personality were there, and with sufficient time and nurturing, I realized it would eventually mature into the book I wanted to send out into the world. It was at that point I began to think seriously about how to go about publishing it. My husband, Rich, and I began talking to the few authors and publishing people we knew, and the response was universal: forget about traditional publishing houses. Fine with me; I had already gone that route in the 90s. A publishing firm paid me a small advance on a book about hospitals; when the hardback came out, their entire marketing strategy consisted of listing it in a few obscure industry publications. I paid for my own publicity campaign, and in the end, sold about 2500 copies. I lost money on the book itself, although it paid off handsomely in consulting assignments for years to come. I preferred the idea of self-publishing, but I had only the haziest idea how to go about formatting, production, marketing, publicity, distribution, etc. Rich and I spent countless hours scouring the Internet, poring over hundreds of articles that offered detailed, often conflicting advice. But we just couldn’t seem to get our arms around the subject. There was simply too much information out there. 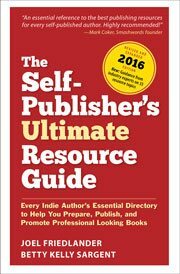 One day I ran across some articles by Joel Friedlander and when I checked out his website, I learned that he was just about to launch his training course, The Self-Publishing Roadmap. Rich and I signed up, and it was one of the best moves we ever made. Slowly, with Joel’s detailed information seeping into our brains, we began to make sense of the vast and complex world of self-publishing. We learned about print-on-demand technology, which makes it easy and cheap to print books one at a time, as they are ordered, eliminating hefty, up-front printing costs. Where I earned less than a dollar a copy on my first book, selling my 213-page paperback on Amazon for $13.95, I would make $4.74 a copy, and even more on Kindle and other e-reader editions. As a professional writer and editor, I figured I could skip hiring anyone to help with editing, but Joel convinced me that everyone needs a fresh, professional review. From among those he recommended, I chose Kathy Carter, and she did a terrific job. In her clear, tactful way, she pointed out where the structure needed shoring up, where my amusing digressions went confusingly far afield, and where I needed deeper descriptions of how I was feeling as adventures unfolded. It cost several thousand dollars and was, as Joel had predicted, some of the best money I spent. Kathy made sure my book has the same professional quality as those coming out of a “real” publisher. Another great piece of advice was to start a social media campaign six months before the pub date. I needed to build a following so that someone out there would be listening when I announced the book was out. Using Weebly’s free software, I created a website and then a blog. I dusted off my little-used Facebook page but was still unsure how to use it until I found Chris Farrell’s great, low-cost ($39/month) course on Facebook. I launched a Twitter campaign and began connecting with other authors and travel writers. I started commenting on other blogs, and pretty soon I was getting requests to do guest blogs (like this one). Dancing in the Fountain: How to Enjoy Living Abroad came out last month. It has received 13 five-star reviews on Amazon.com, where it’s ranked #75 in travel books about Spain. I’ve been invited to speak to book clubs and travel groups, and have appeared in dozens of print, Internet and radio media outlets in the US and Europe. Early sales figures are promising but too preliminary to tell us much. Whatever success the book enjoys, I know I owe a large part of it to the good advice I got, and the support of many others along the way. Thanks for your kind words about the cover, MJ! And I felt the same way about the red tape and formatting. I looked at Lighting Source, which as a great reputation, but in the end I worked with CreateSpace, the Amazon affiliate. I had a good experience with them. As a professional graphic designer, I had a pretty clear idea what I wanted, including the cover. CreateSpace was quick, professional, and well organized. I wasn’t very impressed with their design sense, but they were very cooperative about following my lead. I used BookBaby for the e-book, and had a good experience with them as well. Good luck with your project! Karen- I also love your cover! I was wondering if you went through Lightning Source with your P.O.D. I have a book coming out with a publisher soon, but I’m also working on a self-pub. I’ve managed to muddle through the marketing end for the pubbed book, have a book cover for the self-pub and the MS at an editor as we speak, but what really frightens me is all the red tape and formatting, etc., that you have to do when you self-pub. I considered using an author services company, and may end up there if I can’t figure out how to format and submit my document. What was your experience with this part of the process? I agree that self-published books do need the attention of professional editors, formatters and cover designers if they are to have any chance of success. There’s no shame in asking for help in these areas, especially after the hours a writer has put into their novel just writing it. You’re so right, David. It always helps to get a fresh perspective on a writing project. I got really good advice and did some major revisions. Some were hard, like cutting out favorite anecdotes that didn’t really serve a purpose. But making hard choices really improved the book, so I am very grateful to everyone who helped me take the book to its final form. Thanks for the post about your journey so far, Karen. I agree with Carol, your book cover is a winner! Thanks, Laura. I got a lot of great input about the cover from friends via Facebook, my website and Twitter. Everyone had ideas about the fountain, what kinds of shoes I should use, and so on. I did the photo shoot myself, spending hours on lighting and angles. Then at the last minute my husband said he’d like to try one shot from a higher vantage point. Just to humor him, I passed him the camera, he jumped up on a chair, and bingo! snapped the perfect shot. Serendipity or hidden talent? That’s for future historians to decide. Thank you for sharing your experiences Karen. I really like how you compare your previous publishing experience with your self-publishing one. Although it’s a lot of work to self-publish, I feel that is more rewarding (personally) and quite a bit of fun. Do you agree? I totally agree, Tracy. Although it is a major effort to self-publish, it’s far more exciting and fun to do it yourself. I have learned so much and “met” so many interesting people online that it would have been worth it just for those experiences. And I have really grown as a writer. Not only through doing the book, but also from the many blogs, guest blogs, social media posts and other writing that goes into launching it. Good fun all around. Thanks for clearing that up! For a moment there, I was afraid it was yet more industry jargon I had to learn! After hiring a professional editor this year to work on my ML, I cannot agree more that “everyone needs a fresh, professional review” . I was amazed with how much I learned from her insights and edits. A great experiece for anyone who can afford it. I consider it not just an investment in making my MS more ready for prime time, but also one of the best investmests in my own development as a writer. You make a good point, Carol. Developmental editing improves the author, not just the manuscript. Working with an experienced pro helped draw out the best the book and I had to offer, and made me a stronger writer more able to tackle the next big project.